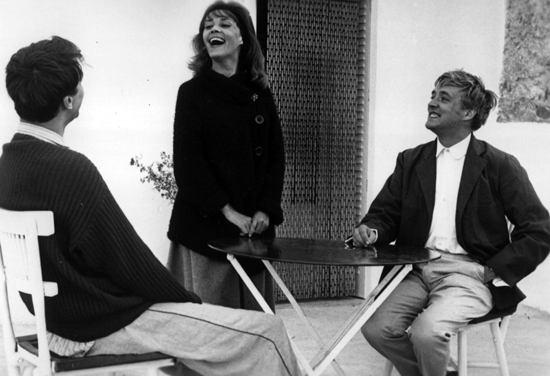 Overview - Hailed as one of the finest films ever made, Jules and Jim charts, over twenty-five years, the relationship between two friends and the object of their mutual obsession. The legendary François Truffaut directs, and Jeanne Moreau stars as the alluring and willful Catherine, whose enigmatic smile and passionate nature lure Jules (Oskar Werner) and Jim (Henri Serre) into one of cinema's most captivating romantic triangles. An exuberant and poignant meditation on freedom, loyalty, and the fortitude of love, Jules and Jim was a worldwide smash in 1962 and remains every bit as audacious and entrancing today. "But not this one, Jim, all right?" When it comes to the films of the French New Wave, movie buffs can often be divided into two camps: Francois Truffaut fans and Jean-Luc Godard fans. Me? Well, I've always been more of a Truffaut guy. Don't get me wrong, I still greatly admire many aspects of Godard's more experimental and intellectual approach to cinema, but there's always been something special about Truffaut's unbridled passion for moviemaking -- a certain exuberance and joy for the craft found in every frame of his work that never fails to inspire me. 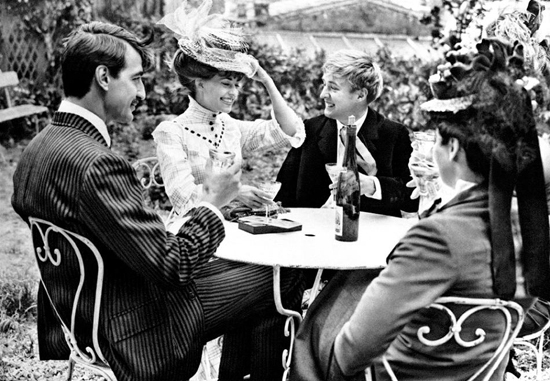 And the director's 1962 masterpiece, 'Jules and Jim,' is a perfect example of this playful cinematic enthusiasm. A wondrously stylistic exercise in formalistic flash, a blithe celebration of love and friendship, and a bittersweet tragedy all wrapped into one, the film is among the legendary director's very best work, and remains one of the quintessential hallmarks of the French New Wave. Based on Henri-Pierre Roche's novel of the same name, the story follows two best friends -- Jules (Oskar Werner) and Jim (Henri Serre) -- as they both fall in love with the same woman, the carefree and unpredictable Catherine (Jeanne Moreau). As their love triangle traverses several ups and downs, for a time it eventually seems like the three might be able to live happily together, but Catherine's continually capricious and occasionally vindictive behavior eventually disrupts their peaceful existence, potentially spelling doom for the lovers' hopes of uncomplicated bliss. Truffaut opens the film with a potent explosion of free-flowing style, perfectly setting the stage for the inventive and methodically unruly experience to follow. A montage of quick cutting sequences economically establish the effortless friendship between the title characters, and brief flashes of future scenes offer tantalizing promises of what is to come. Likewise, a fast-talking narrator fills us in on little details and internal thoughts, elaborating on what's on screen and in the characters' thoughts while evoking the spirit of the novel in a cinematic manner. Likewise, the rest of the runtime offers a similar abundance of formalistic moviemaking techniques, calling attention to the film's existence as a motion picture without disrupting the story or emotions of the narrative. Key lines of dialogue will appear written on-screen emphasizing their significance, superimpositions will layer images over one another, and periodic freeze frames will suspend important moments in time, heightening the reality of the story in ways that only cinema can. And all of these intermittent flourishes are held aloft by a persistently kinetic and buoyant shooting style, defined by wondrous camera movements. Tracks, dollies, cranes, zooms, and handheld shots all litter the picture, and Truffaut frequently avoids traditional coverage through frequent pans and twirling images that circle and whirl around characters and locations, using the shifting frame to draw connections. Extended sequences and montages showcase the central trio during idyllic stretches in their relationship, highlighting bicycle rides and day trips to the beach, and all of these scenarios absolutely brim with life thanks to Truffaut's irresistible visual style. But as light, quick, and exuberant as much of the pacing and style can be, there are also notable segments where the director will slow down the tempo, giving way to quietly dramatic, romantic, sensual, and melancholy passages that hint at deeper pathos and impending tragedy. The characters' unconventional relationship is treated with a deft hand, revealing all of the joy and pain it can cause, and Truffaut's highly influential direction is bolstered wonderfully by powerful performances. Oskar Werner and Henri Serre are great as the unsuspecting friends who both fall for the same women. Werner, in particularly, ends up becoming a rather sympathetic figure, and as the love struck Jules he walks a fine line between pathetic devotion and selfless adoration. Meanwhile, Serre's Jim is a bit harder to pin down, but the actor imbues the character with charm and frustration as he increasingly rebels against his lover's fickle whims. And then there is Catherine herself. Simply put, Jeanne Moreau is a revelation here, and together, she and Truffaut craft one of cinema's most memorable and multifaceted female leads. A true force of nature, Catherine is strong-willed, playful, stubborn, full of life, spiteful and absolutely untamable. Those last two bits prove to be the source of much of the film's drama, and while the woman can be unlikeable at times, Moreau gives the part layers of depth, balancing her unsavory qualities with an incandescent spark that shines whenever she's on screen. More than just a mere object of desire or a source of conflict for Jules and Jim, she is a fully realized character all her own -- packed with irresistible allure and costly flaws. Through his adaptation of Henri-Pierre Roche's novel, director Francois Truffaut effectively capitalizes on all of the unique attributes of filmmaking, using form and style to translate the literary into the cinematic, creating a work brimming with visual and auditory texture. Lively, bouncy, full of substance, and marked by just the right amount of jaunty disorder, the film's influential style has gone on to inspire many modern filmmakers (perhaps most notably, Wes Anderson) and continues to feel fresh and innovative to this day. And beneath all of that impressive flash, is a rich, emotional, heartfelt, joyful, and occasionally somber narrative about deep friendship and love between "three lunatics." One of Truffaut's crowning achievements, 'Jules and Jim' remains an essential and timeless piece of world cinema, ensuring that Catherine's unknowable smile will continue to entice and bemuse unsuspecting audiences for years to come. 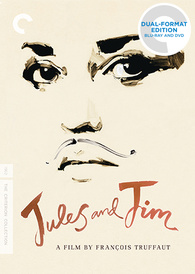 Criterion presents 'Jules and Jim' in a Dual Format Blu-ray/DVD combo pack. A BD-50 Region A disc and two DVDs come packaged in a foldout case housed in a cardboard slipcover with spine number 281. A booklet featuring an essay by critic John Powers, a 1981 piece by Truffaut about Roche, and some of Truffaut's script notes to co-writer Gruault is also included. The movie is provided with a 1080p/AVC MPEG-4 transfer in the 2.35:1 aspect ratio. Nearly pristine and absolutely gorgeous, this is one of the most impressive classic film transfers that I've come across in quite some time. With the exception of a fleeting scratch or line here and there, the print is essentially flawless, and at times looks brand new. A moderate, natural layer of fine grain is apparent throughout, adding sumptuous filmic texture to the image. Clarity is often exquisite, with sharp textures and patterns visible in clothing, objects, and facial features, fully realizing every line of intrigue and mystery in Catherine's irresistible smile. Dimension is impressive as well and the grayscale is also nicely balanced and natural, with bright whites and deep, inky blacks (though there is some negligible pulsing). It should be noted, however, that Truffaut does make use of archive footage during certain stretches (mostly of World War I), and these clips show much more apparent signs of wear and tear and are less sharp than the regular footage (but that's always been the case). 'Jules and Jim' arrives on Blu-ray with an absolutely exemplary transfer, free from any troublesome noise reduction or artifacting. Authentic, respectful, clean, and beautifully detailed, this is classic cinema in HD at its best. The audio is presented in a French LPCM mono track along with optional English subtitles. Though understandably basic, the mix feature impressive clarity and one of the medium's greatest musical scores. Surprisingly crisp and full for its age, dialogue comes through very cleanly. Effects work is solid as well, offering some decent ambiance throughout the single channel of audio, effectively conveying simple atmospheric sounds like birds, waves, and explosions in the archive war footage. The real highlight here, though, is Georges Delerue's strikingly beautiful music. Widely regarded as one of the greatest scores ever written, Delerue's jaunty tunes and achingly somber melodies all come through with wonderful fidelity, casting a periodically joyful and melancholy mood over the film's inventive visuals. Free from any notable pops, crackles, or background hissing, much like the video transfer, this audio mix is essentially devoid of any age-related issues. Simple but authentic, this is a great track that features some truly amazing music. Criterion has put together a fantastic and very comprehensive collection of supplements, including two commentaries and a wealth of interviews with the director and his collaborators. All of the special features are presented in upscaled 1080i with Dolby Digital 1.0 audio and English subtitles for the foreign language portions (unless noted otherwise). Commentary with Truffaut's Collaborators - Recorded in 1992, this track features frequent Truffaut collaborator Suzanne Schiffman, co-writer Jean Gruault, and editor Claudine Bouche, along with comments by Truffaut scholar Annette Insdorf. Packed with production trivia, anecdotes from the shoot, insights into Truffaut's directing, and analysis of the film's story, characters, and style, this is a great track that fans will definitely want to listen to. Commentary with Jeanne Moreau - Recorded in 2000, this commentary features actress Jeanne Moreau and film critic Serge Toubiana presented in French with English subtitles. Moreau traces how she got involved with the project and shares many production stories. While there are some occasional gaps in the conversation, it really is wonderful to hear her fond memories from the shoot and lasting admiration for the movie. The True Story (HD) - This section includes "Truffaut on Roche" (7 min) and "The Key to Jules and Jim" (31 min). The former is an excerpt from a television interview with the director about the film's source material and its author. The latter features excerpts from a 1985 documentary that focuses on the actual people who inspired the characters in Roche's novel and the film. Truffaut on Truffaut (HD) - Separate interviews with the director from 1965 (9 min), 1969 (32 min), 1977 (10 min), 1979 (29 min), and 1980 (28 min) are included. The director discusses the source material, working with the cast, his visual style, editing techniques, auteur theory, criticism of his films, interviewing Hitchcock, and his passion for cinema. Raoul Coutard (HD, 19 min) - Here we get an interview with the film's cinematographer. Coutard discusses what it was like working with the director, and elaborates on the film's lighting, shooting style, and the family atmosphere on set. Jean Gruault (HD, 21 min) - This is a 1986 interview with the film's co-writer. Gerault traces his working relationship with Truffaut and touches upon their different collaborations. Robert Stam and Dudley Andrew (HD, 23 min) - This is a discussion with the two film scholars that was recorded in 2004. Stam and Dudley analyze the movie's visual style, celebrated opening montage, source material, and story, offering some interesting and worthwhile insights. Francois Truffaut's 'Jules and Jim' is a French New Wave classic that remains just as timeless and innovative today as it did during its original release. 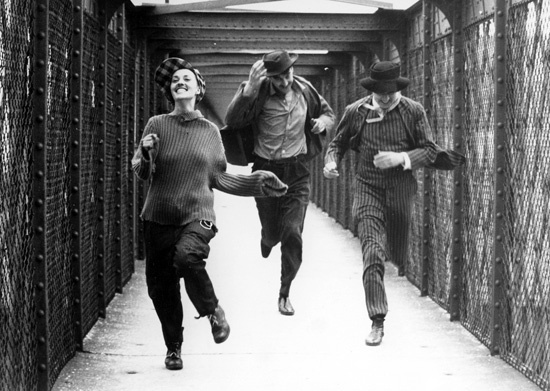 Marked by a highly influential visual style and an iconic performance from actress Jeanne Moreau, the movie is an exuberant, bittersweet, and passionate piece of motion picture art. This release from Criterion features an impeccable video transfer, a great audio mix, and a wonderful set of comprehensive supplements filled with worthwhile insights into the film's production. A top-tier release through and through, this disc comes very highly recommended for all viewers, and is an absolute must own for fans of classic world cinema.